Staff from California Home Builders help the Village Gardeners at its Moorpark Point Project Site, in Sherman Oaks. Volunteers removed invasive, non-native plant species, cleared brush and planted several native plants and spread mulch to restore the soil. Many thanks to all for their hard work! Special thanks to California Home Builders for its generous contribution to help make this event possible and to help the Village Gardeners continue its efforts in the Los Angeles River greenway! This years Los Angeles River - Green Living Fair, was co-hosted by the Studio City Neighborhood Council's, Outreach Committee and The Village Gardeners of the Los Angeles River. This exciting event took place at the Richard Lillard Outdoor Classroom, in the Valleyheart Riverwalk Greenway, where approximately 25 local non-profits came together for community outreach, to hear live music, see theatre & dance performances, best baked pie contest, fruit tree adoptions, and more. 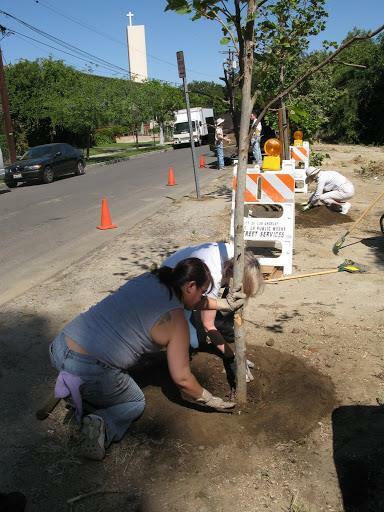 5-gal fruit trees and shade trees were provided by the city of Los Angeles, through it's Million Trees Initiative. The free family friendly event was attended by hundreds from the community. Many thanks to all those that participated! Volunteers from United Talent Agency, partner with the Village Gardeners to help maintain the Los Angeles River Greenway in Studio City, CA. Volunteers helped mitigate litter in the greenway and surrounding streets, to prevent it from getting into the river. They also cleared the catch basins in close proximity to the river and nearby, along Ventura Blvd. What an awesome job they did! Their efforts have a huge impact on our community. Many thank to United Talent Agency! THIS EXCITING GROUNDBREAKING CEREMONY HELD ON JULY 13, 2013, WAS ATTENDED BY MANY FROM THE COMMUNITY. THE PROJECT FIRST CONCEIVED BY THE VILLAGE GARDENERS IN 2008, IS BEING IMPLEMENTED BY LOS ANGELES COUNTY AND IS SCHEDULED FOR COMPLETION BY FEBRUARY 2014. MANY THANKS TO LOS ANGELES COUNTY SUPERVISOR, ZEV YAROSLAVSKY FOR IMPLEMENTING THIS SPECTACULAR PROJECT AND FOR HIS KIND SUPPORT OF THE VILLAGE GARDENERS EFFORTS! Staff from Baxter Bioscience aid the Village Gardeners during a 2-day event in Studio City, CA. Event began at the Richard Lillard Outdoor Classroom with orientation. There they received assignments, gloves, reflective safety vest and tools for the tasks that were undertaken during 2 of the next 3-days. Volunteers pruned shrubs and trees, cleared brush, picked up hundreds of pounds of liter, cleared the gutters and catch basins along Valleyheart Dr on north and south sides of the Los Angeles River. Next day the group moved over to a badly neglected section of Ventura Blvd., from Coldwater Cyn Ave to Goodland Ave (by Ralph's Market, Starbucks & Petco). After that we all moved back along the river behind Jerry's Deli and Bed, Bath & Beyond for more LA River greenway, TLC. I must say this was truly one of the best volunteer groups I have ever worked with! They were so enthusiastic and so much fun, that the time passed by quickly. Many thanks to Baxter Bioscience for its generosity, by giving staff paid time off to help us help the environment & our community and many thanks to all the volunteers! We love you guys! Special thanks to Councilmember Paul Krekorian and to Bladimir Campos and Ron Lee from the City's Bureau of Sanitation for their support. 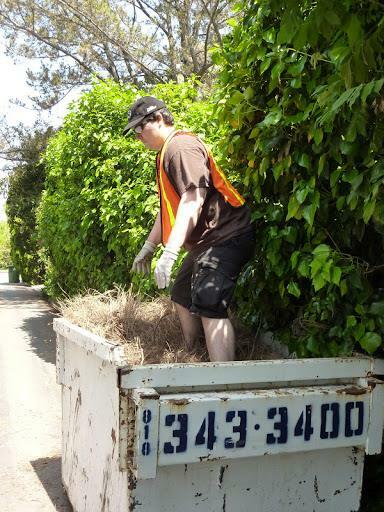 THE VILLAGE GARDENERS LEADS STUDENTS AND STAFF VOLUNTEERS FROM HARVARD WESTLAKE SCHOOL OF STUDIO CITY, AS THEY REMOVE LITTER, CLEAN GUTTERS, SWEEP SIDEWALKS AND CLEAR CATCH BASINS ALONG THE WAY. THE STUDENTS DID A FANTASTIC JOB AND REALLY MADE A DIFFERENCE IN THEIR COMMUNITY. THANKS TO ALL FOR THEIR HARD WORK! STUDENTS FROM LOS ENCINOS SCHOOL LISTEN TO GUEST SPEAKER, STEVE HARTMAN, FROM THEODORE PAYNE FOUNDATION FOR NATIVE PLANTS AND WILD FLOWERS. STUDENTS ALSO DID A METICULOUS JOB REMOVING INVASIVE, NON-NATIVE PLANT SPECIES ALONG VILLAGE GARDENERS', POPPY WALK. MANY THANKS TO ALL FOR THEIR HARD WORK! Treepeople and The Village Gardeners come together to host a nature walk along the Los Angeles River in Studio City and Sherman Oaks, CA. Staff from TreePeople and the Village Gardeners use their expertise to identify many of the plants within the Village Gardeners' adopted LA River greenway, for a group of nature lovers from the community. Led by The Village Gardeners, students, teachers and parents from Los Encinos School come out to plant native plants and attend a nature walk along the LA River greenway in Studio City. They did an excellent job and we hope to see them again soon for more fun! Many thanks to all for their hard work! Volunteers from Baxter Bioscience help the Village Gardeners maintain the LA River greenway at the Richard Lillard Outdoor Classroom, in Studio City. What an incredible job they did! Volunteers from Crespi Carmelite High School in Encino volunteer to help the Village Gardeners maintain their adopted LA River greenway. Many thanks to all the students for their hard work! Planting continues at the Moorpark Point Project site with help from United Talent Agency and Generation Water. Volunteers enthusiastically plant native plants and spread mulch to conserve water, protect the plants, mitigate erosion and nourish the soil. Many thanks to all for their hard work! Special thanks to our generous sponsors for making this project possible! Sponsors: United Talent Agency, Patagonia Pasadena, Rotary Club of Studio City/Sherman Oaks, Peet's Coffee & Tea (Studio City), The Charitable Foundation, Generation Water and many more generous souls from the community. Once again, our hard work has paid off with awesome results!!! Special thanks to our partners at TreePeople and L.A. Conservation Corps', River Corps staff and volunteers from the community, for their hard work and support. Many thanks to Councilmember Paul Krekorian and his staff for their support and the City of Los Angeles', Office of Community Beautification for supplying the tools for this and many other events! As a result of this awesome display of community participation, we were able to perform substantial maintenance along a 1/2 mile stretch of the Village Gardeners' Valleyheart Riverwalk Greenway in Studio City and Sherman Oaks, CA. 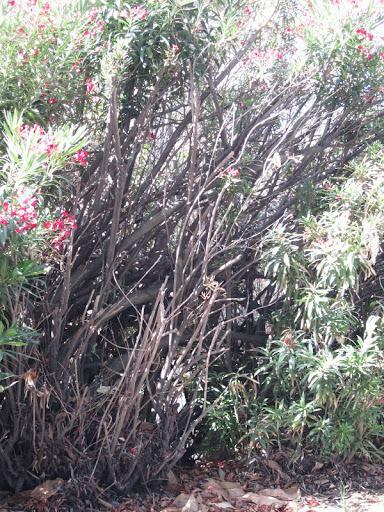 Oleander leaf scorch continues to plague the LA River greenway in Studio City and Sherman Oaks, California. Working with LA County and Mountains, Recreation & Conservation Authority, The Village Gardeners continues to re-introduce native plant species in their place. Volunteers from Keller Williams Studio City team up with The Village Gardeners to give the Valleyheart Riverwalk Greenway some TLC. The volunteers enthusiastically cleared brush, swept the gutters along Valleyheart Drive and cleared the catch basins of debris along more than a mile of LA River greenway. What an awesome job they did! Many thanks from The Village Gardeners for all their hard work! Students from Kimberly Schwiesow's 4th grade class enjoy an LA River nature tour provided by the Village Gardeners. Students learn about the importance of native plants to the ecosystem, the source of water that supplies the LA River and more. Then, complete the tour with lunch at the Richard Lillard Outdoor Classroom before returning to school. Hundreds turn out in observance of the Mayor's, Good Food Day-LA. A collaboration of several area non-profits including, the Studio City Neighborhood Council, the Village Gardeners, N. Hollywood NE Neighborhood Council, Mid-Town No Ho Neighborhood Council, Turning Pages Foundation, Celerity Palmati Charter School, TreePeople, Backwards BeeKeepers, Girl Scouts, Million Trees LA, LA Conservation Corps, FormLA Landscaping, LA Urban Chicken Enthusiasts and more. Approximately, 150 fruit trees were adopted by LA residents at the event through the City of LA's, Million Trees LA initiative. The event had the feel of a county fair and was fun for all ages. Many thanks to Mayor Antonio Villaraigosa and the City of LA for sponsoring this exciting event and to everyone that helped make this event possible! This LA River Restoration project was made possible through the generosity of The Rotary Club of Studio City & Sherman Oaks, Peet's Coffee & Tea, The Charitable Foundation, Home Depot, Davey Tree and many more from the community. Many thanks from the Village Gardeners to all the contributors for their generosity and to the volunteers for their hard work! Special thanks to the non-profit org Philanthro for their help in implementing this project. Special thanks to Davey Tree Company for helping us with site preparation by removing dead trees and pruning existing to make way for more native plants! Enthusiastic volunteers from Baxter BioScience show some love to The Village Gardeners' native plant garden at the Richard Lillard Outdoor Classroom in Studio City. The volunteers spent the day removing invasive, non-native plant species from along the trail next to the river where the California Golden Poppies have grown for several years. The volunteers also planted some native plants. This first event of the season paid off with awesome results! Many thanks from The Village Gardeners for your generous giving of your precious time! The North Valleyheart Riverwalk (Greenway) project is now a Los Angeles County project! Not only is the county committed to implement the project, The Village Gardeners’ proposal for a beautiful and accessible native plant filled greenway, along the Los Angeles River, is their entry in the California River Parkways, Proposition 84 grant competition. Our project has been moved to the head of the line of LA County’s, LA River projects! Special thanks to LA County Supervisor Zev Yaroslavsky, his staff and LA County's Dept of Public Works for their generous support and hard work! See North Valleyheart Riverwalk project plans here. The City of Los Angeles, through its Adopt-A-Basket program, has supplied new trash cans for the Valleyheart Riverwalk Greenway. To further the improvement, The Village Gardeners recently purchased and installed self-closing lids, which was made possible through the support and generosity of the community. Currently, The Village Gardeners services 11-trash cans along the Los Angeles River on a weekly basis. Many thank to students from Crespi Carmelite High School for helping the Village Gardeners maintain the native plant garden at the Richard Lillard Outdoor Classroom in Studio City. They removed invasive, non-native plants species, mulched to restore the soil, cleared the catch basins along the river and more. They did an excellent job and their hard work paid off with awesome results! Many thanks to student volunteers from USC and members of the community for their hard work at the native plant garden at the Richard Lillard Outdoor Classroom in Studio City. They did an exellent job of removing invasive non-native plant species, mulching to restore the soil, cleared the catch basins along the river and more. Once again, our hard work has paid off with awesome results!!! Special thanks to the volunteers of the non-profit organizations Corregidores Lions Club, Philanthro, L.A. Conservation Corps', River Corps crew, staff and volunteers from TreePeople, the Village Gardeners and other members of the community, for their hard work and support. Many thanks to the City of Los Angeles', Office of Community Beautification for supplying the tools for this and many other events! As a result of this awesome display of community participation, we were able to perform substantial maintenance along a 1/2 mile stretch of the L.A. River in Studio City and Sherman Oaks, CA. Next event: Saturday, August 20. Please see website for details. Many thanks from the Village Gardeners! A project of The Village Gardeners made possible through the generosity of the community. 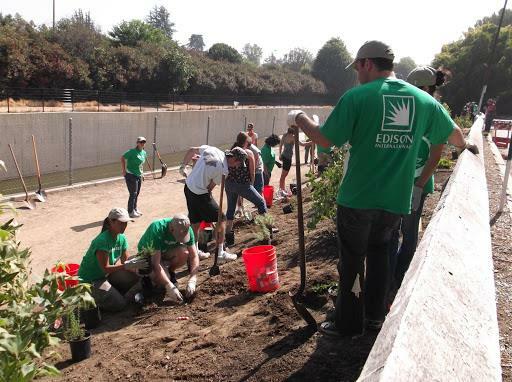 Volunteers from Sony Pictures Entertainment, Southern California Edison and the Village Gardeners come together to re-plant a section of the Los Angeles River that was devastated by Oleander Leaf Scorch disease. Special thanks to The Charitable Foundation, Rotary Club of Studio City & Sherman Oaks, Safeco Insurance Foundation, Sony Pictures Entertainment, Wells Fargo Bank and others from the community for their generous donations, and to all the volunteers for their hard work! The Village Gardeners observe Mayor Villaraigosa's and the City of Los Angeles', Day of Serice on the Los Angeles River Event with an L.A. River restoration event in their adopted 1/2 mile section of the L.A. River in Studio City and Sherman Oaks, CA. During The Village Gardeners' event, volunteers from the community swept the streets along the river, cleared the catch basin covers, provided tree care maintenance to native trees, removed invasive, non-native plant species and mulched around the native plants to restore the soil and to retain moisture over the long summer ahead. Special thanks to Mayor Villaraigosa and the City of Los Angeles for the funding for supplies and materials for the event and to the volunteers for their hard work! The Village Gardeners' 3rd annual, L.A. River restoration event at the Richard Lillard Outdoor Classroom in Studio City, CA. Volunteers from the community remove invasive, non-native plant species and mulch the grounds of the native plant garden to restore the soil. Special thanks to the Buckley School's, S.O.S Go Green Club, for their continued support of our efforts, which have paid off with awesome results! Recent photos from the native plant garden at the Richard Lillard Outdoor Classroom in Studio City. This is in the Village Gardeners' adopted stretch of the L.A. River. Our hard work has paid off well! Thanks to all the volunteers for their participation and to the community for it's support! L.A. County's Dept of Public Works does river survey needed to start the planning and engineering of the Valleyheart Riverwalk Greenway project in the Village Gardeners' adopted section of the L.A. River. Go L.A. County! We love you guys! The Village Gardeners helps the City of Los Angeles by cleaning clogged catch basins along the L.A. River, in their adopted section of the river between Coldwater Cyn Ave and Fulton Ave. Village Gardeners continues clean-up along Valleyheart Drive on the south side of the LA River, from Coldwater Cyn Ave to Fulton Ave.
Corona Tools donates a generous selection of garden tools to The Village Gardeners to help with L.A. River greenway maintenance. The tools included loppers, hand pruners, extension pole pruners, pruning saws and more. Many thanks from the Village Gardeners for their generous gift of much needed tools! Pictured from left to right, front row: Past President Linda Mangahas, Pres. Ellie Suarez, Delia & Rick Rabins, Central Region Chair Eleanor Evangelista of the LA Golden Eagle Lions Club and Pres. Edith Javier of the LA New Millenium LC. Left to right, back row: Zone Chair Guido Suarez, Lion Zeny Dominguez of the LA Golden Eagle LC, Delfin Poquiz, Lion Beebop Poquiz, Ludy Salvio, Rudy Salvio, Lion Jojo Barrientos and Lion Willy SantaMaria of the LA New Millenium LC. Also present but not shown in the picture were: Max Dominguez of the LA Golden Eagle LC, Lion Ven Javier of the LA New Millenium LC and Leo David Barrientos. Village Gardeners' President, Rick Rabins, receives Citizen of the Year award from Corregidor Lions Club of Los Angeles. On September 26, 2010, I was honored by the Corregidor Lions Club for outstanding and dedicated civic and environmental service to the community of Los Angeles. What an honor it is to have received this prestigious award. Several club members have volunteered at various Village Gardeners events. Many thanks to club members and officers for this award and for all their dedicated service to the community. The Village Gardeners' tool shed, at the Outdoor Classroom in Studio City, gets a make-over from volunteers from the community! This L.A. River greenway maintenance event, a collaboration of TreePeople and The Village Gardeners, was a hugh success due to the participation and hard work of L.A. Conservation Corps', L.A. River Keepers, staff and volunteers of TreePeople and The Village Gardeners. During the event, native shrubs were carefully hand pruned and mulched. Many thanks to all for their participation and support! Also, special thanks to L.A. County, Dept of Public Works and L.A. County Supervisor, Zev Yaroslavsky, for making the Earth Day 2008 Event Site a reality. As a community service, the all-volunteer, Village Gardeners, pruned all the shrubs and trees along the L.A. River on Valleyheart Drive. This work was done on the north and south sides of the river between Coldwater Cyn Ave and Fulton Ave, in Studio City and Sherman Oaks. Wells Fargo Bank gives generously to the community! At the grand opening ceremony of their New Studio City Branch, bank officials and staff presented grant checks to 6-area non-profit organizations. Thanks to Wells Fargo's generosity, The Village Gardeners is one step closer to implementing their "Steps To The Riverwalk" project. Once implemented, this will be the only improved pedestrian accessway, on the north side of the L.A. River, for miles in either direction. Wells Fargo Bank, WE LOVE YOU! MANY THANKS! The Village Gardeners' partner organizations, S.O.S GoGreen Club, Studio City/Sherman Oaks Rotary Club, and Harvard Club of Southern California get a jump start on Earth Day at the Outdoor Classroom. Volunteers mulched the recently planted native trees, planted more native plants and removed invasive, non-native plant species. This native plant garden is looking so good! Thanks to all for their hard work! 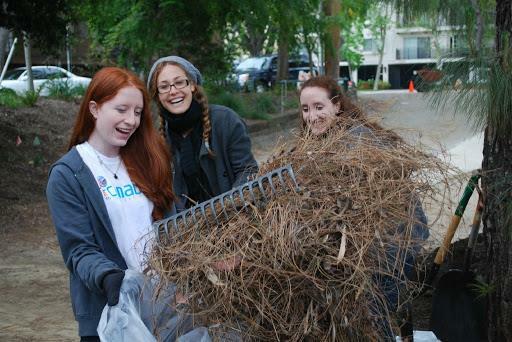 Millikan Middle School and The Village Gardeners co-host a community clean-up event sponsored by Heal The Bay. Students of Millikan Middle School tidy up their Sherman Oaks campus as well as surrounding streets, while The Village Gardeners lead a team along the L.A. River in their adopted section between Fulton Ave and Coldwater Cyn Ave. Volunteers collected approximately 315 lbs of litter during the event. The event was organized by the Millikan Middle School PTA and school staff. Many thanks to all for their support and participation! L.A. County's Dept of Public Works begins long awaited fencing upgrade along the L.A. River in Studio City. Once completed, it will enable the county to open this section of the L.A. River greenway to the community. This section was previously adopted by The Village Gardeners in 1998 through the county's Adopt-A-Riverbank program. 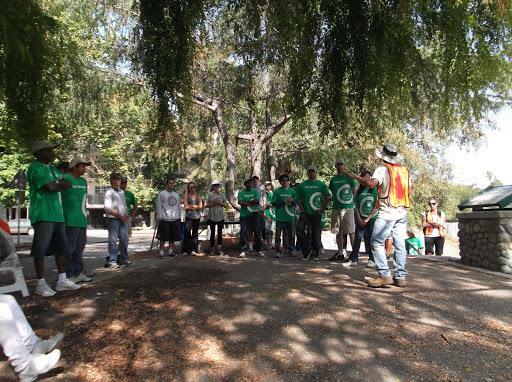 An all-volunteer group helps the Village Gardeners maintain the Valleyhear Riverwalk Greenway, in Studio City. Special thanks to Paramount Studios staff for their participation and support. Their participation and support really made a difference! Thanks again to all from the Village Gardeners for doing such an awesome job! The Village Gardeners Adopts More Trash Cans For L.A. River! Credit for servicing the trash cans along the L.A. River, between Coldwater Canyon Ave and Fulton Ave, goes to Peter Regli, Haig Mkhoian & Rick Rabins. Haig is the founder and president of the non-profit organization, Haig It Up, a Village Gardeners partner organization. Also, special thanks goes to the Mountains, Recreation & Conservation Authority's maintenance staff for servicing the 3-cans near the Richard Lillard Outdoor Classroom. Serving the community with pride! Bill McGeorge, Ingrid Dragan (Secretary and board member), Rick Rabins (President and board member), Fiona Chatfield, Michael Dragan, Tina Curran (Treasurer and board member). The Village Gardeners Adopts 2-More Trashcans For The L.A. River! The Village Gardeners' member volunteers have been servicing several trashcans along the river for many years through the city's Adopt-A-Basket program. This community service helps fill a void due to inadequate municipal trash service along the river. Another successful planting event hosted by The Village Gardeners was attended by approximately 50, enthusiastic students and parents of Campbell Hall School, and other neighborhood schools. 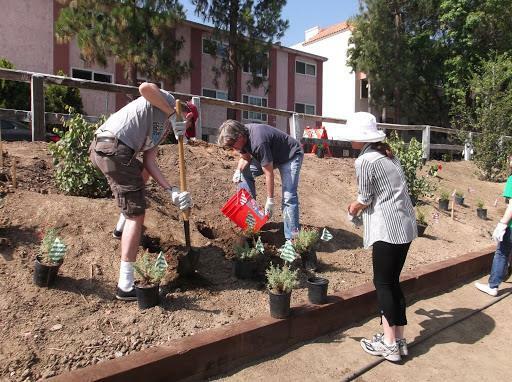 As a community service, the all-volunteer group planted close to 100 native plants at the Native Plant Garden at the Richard Lillard Outdoor Classroom, in Studio City. Many thanks to all for their hard work and support! This L.A. River, native plant garden restoration, is ongoing. For more info please log on to http://www.TheVillageGardeners.org/eventsandprojects.html . Thank you. Prayers answered for The Village Gardeners when over 150 volunteers show support by planting 300 native plants at the Richard Lillard Outdoor Classroom in Studio City, CA. During his Earth Day presentation, Village Gardeners' President, Rick Rabins, expressed appreciation to volunteers, contributors and sponsors, whom without their support, the project could not have been implemented. For the complete list please go to http://www.thevillagegardeners.org/support.html. Thank you. Help the Village Gardeners restore natural habitat along the Los Angeles River, at the Richard Lillard Outdoor Classroom, in Studio City. Project includes removal of invasive non-native plant species to allow natives to flourish, mulching to restore the soils and keep trees and shrubs healthy, planting natives and more. Our goal is to create a model California native plant garden in 2009. Time: 9:00 AM - 12:00 PM. Snacks and refreshments will be served. Your participation will make a difference! (Please dress appropriately! No open toe shoes, use sunscreen and wear a hat). Jacob Castroll of Jacob Castroll Insurance presents Rick Rabins, President of The Village Gardeners, with grant check. Safeco Insurance Foundation gives generously in support of the Valleyheart Riverwalk Greenway, in Studio City and Sherman Oaks. Funds to be used to purchase trash cans, sanitary dog-waste bag dispensers, plants and more for L.A. River between Coldwater Cyn Ave and Fulton Ave. Special thanks to Jacob Castroll of Jacob Castroll Insurance for nominating The Village Gardeners through Safeco’s Agent Giving Program. www.TheVillageGardeners.org for more info. I hope you all had a great holiday season! I want to express my appreciation for your support over the past year. We have made a great deal of progress, which I'd like to briefly explain. We have recently received a Letter of Support from L.A. County for our Valleyheart Riverwalk Greenway. Unfortunately, we were unable to compete in the city's Community Beautification Grant program with our "Steps to the Riverwalk" project. However, the county is so supportive they have decided to move ahead starting with a "Concept Report", the first step in the planning of a new LA River greenway, to improve the entire 1/2 mile stretch from Coldwater Cyn Ave to Fulton Ave (north side of river). I have been told that the draft Concept Report should be ready soon. We have recently received a generous $5,000 Grant from Safeco Insurance Foundation, and a generous $2,500 contribution from Councilmember Jack Weiss of Council District - 5, with special thanks to his field deputy Joan Pelico. Also, there have been several contributions of up to $1,000 each. We can use these funds to purchase new trash cans with self closing lids, Sanitary Dog Waste Bag Dispensers, plants and more, in 2009! We are planning to develop the irrigated area around the Outdoor Classroom into a model California Native Plant Garden, in 2009. We will accomplish this with the help of volunteers from the community, including neighborhood schools. With the anticipated continued support we received in 2008, I predict 2009 will be another very productive year for us. Oct. 19, 2008, Sunday - The Village Gardeners and FOLAR partnered River Walk Event. Join us for a 1 mile walk to learn what the Village Gardeners is doing to beautify our adopted stretch of the L.A. River in Studio City & Sherman Oaks. Meet at 12953 Valleyheart Dr, Studio City, 91604, just west of Coldwater Cyn Ave (north side of river). 4:30 - 6:00 P.M.
October 26, 2008, Sunday - "Make a Difference Day"
The Village Gardeners will donate $5 to PATH (People Assisting the Homeless) for each volunteer that participates in this event. 4th Sunday of the month - SUSPENDED UNTIL FURTHER NOTICE! PLEASE CHECK OUR WEBSITE FOR UPDATES. THANK YOU!! !